Mahir goes to Cherbourg to welcome the Icon coming from Ireland (14:00) and to transfer it to Vaudricourt. 0/ (20:00) Waiting and welcome ceremony. Vigil. 1/ Prayer vigil in Vaudricourt, North of France, by the Missionary Oblates of Saint Casimir Institut. 2/ 2 pm the Icon is wellcomed by all 250 schoolboys in Courset runing to the school church for the first prayer vigil. 3/ Prayer vigil for life and Eucharistic adoration with the Emmanuel Community at Boulogne sur Mer (in front of England). 5/ On the morning at the Maison de l'Immaculée, rue Boileau in Paris, the Icon wellcomed by a large polonaise, portuguese and indian community. 6/ At 12, Notre Dame du Lys, rue Blomet in Paris. 7/ The evening at the parish in Belloy en France, north of Paris, prayer vigil with local people. 8/ Morning: Notre-Dame du Bon Conseil, parish rue de Clignancourt in Paris: The Icon wellcomed by many children and a full church. Mary is the children Mother. 9/ Midday: Saint Pierre du Gros Caillou in Paris: many many Children praying for life (200). 10/ The evening at Saint-Etienne du Mont in Paris old towncenter: many students praying in front of the Eucharistic adoration, the Icon of Jasna Gora and the Notre-Dame-de-France statue. 12/ The Icon leaves Paris to Genlis parish near of Dijon (Burgondy), mass at 12. with the Icon, rosary, with a lot of people. 13/ The evening at Strasbourg (Alsace), wellcomed by polish motars and the polish community at Notre Dame de Lourdes. 15/ Collège Saint Dominique at La baffe in the Vosges montains. Bernard drives in the snow. More than hundred schoolboys and girls educated by sisters. 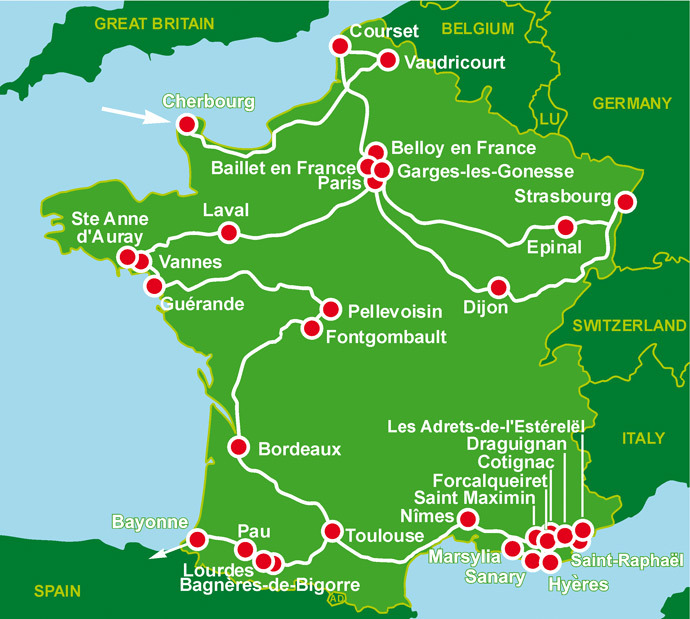 16/ Back to Baillet-en-France, headquaters, Tamil and Travellers on the Confrérie Notre-Dame-de-France, north of Paris. Mass, rosary, with a large chaldean comnunity, during the night. The Chaldean speak the same language as Christ did. 17/ Sainte Geneviève parish at Garges-les-Gonesses, arm suburbs north of Paris. 18/ Cotellerie abbey at Laval (west of France), Petits Frères de Marie Mère du Rédempteur. 19/ Vannes cathedral (Bretagne), prayer vigil directed by the bishop Mrg Centene. 20/ Saint Anne d'Auray sanctuary (Bretagne), where are kept Holy Anne relics, prayer vigil with the Icon during the night. 22/ Vigil with the copte orthodox community in Guérande (Bretagne). Many people during 2 days. 25/ Notre Dame de Pellevoisin sanctuary (Touraine). A lot of young mothers praying for life. 26/ Fontgombault abbey & parish (Poitou): 88 monks very happy to welcome the Icon of Jasna Gora. Appointment with silence, says Bernard, who is invited by the Abbot to come back next time to the monastery. 28/ 2 pm rosary with many hundreds of children at Saint Bruno Parish in Bordeaux (Aquitaine). 29/ Lycée de la Sauque, south of Bordeaux. A lot of schoolboys & giels asking for wellcome the Icon themselves and animate the vigil. 30/ back to Saint Bruno Parish in Bordeaux: new vigil. 31/ Go to Toulouse (South of France), the Icon welcomed by Femmes International Murs Brisés, an International Association of Assistance. Many Gipsies. 32/ Bagnères de Bigorre (Pyrénées), soeurs carmélites de l’Enfant-Jésus, where the sisters wanted to bring the Icon themshelves. 33/ Lourdes parish at the evening, with parish people, polish and Russian orthodox communities. 34/ International mass at the Lourdes Sanctuary celebrated by the bishop of Lourdes, several others bishops and many priests, 20.000 people despite of a big cold. The Icon in the middle of the procession. Then rosary at the Grotte: the Icon was settled on the autel in front of the big crowd. 36/ Go to Nimes (Languedoc 450 kms to the east), at the Clarisses monastery. No photo because of cloister ! A point: sisters who were persecuted at Tibherine in Algeria were welcome at the monastery. 37/ Notre dame des Graces & Joseph sanctuary at Cottignac (Provence, south-east of France). At Cottignac, King Louis XIII, who couldn’t expect for a son with his wife in the beginning of the 17th century, prayed to St Joseph and promised to devote France to the Sacred Heart of Jesus if they had a son. The son Louis XIV came and the King devoted France to the Sacred Heart of Jesus. 38/ Saint Nazaire at Hyères parish in Toulon port. Wellcome by a chilian priest and a lot of people. 39/ La Servianne monastery in Marseille (Provence). Sisters wellcomed the Icon and prayed. 40/ Notre Dame de la Consolation parish in Toulon (Provence): rosary and Eucharistic adoration by the people. 40/ Saint Maximin monastery (Provence), prayer with sisters. 42/ Forcalqueiret parish (Provence), where the Icon was brought to dying people at home, after the rosary vigil. Mass & rosary for the non born babies. 43/ Sainte Victoire basilica in Saint-Raphaël (Provence): many people full church. 44/ Soeurs de la Consolation in Draguignan (Provence): the Icon welcome by many children with French flags. 45/ Les Adrets parish (Provence): Mass & rosary for the non born babies. 46/ Church of St. Therese, Holy Family Parish in Pau (South west of France back near Lourdes). 48/ Puyoô private chapel, Pays Basque, vigil between friends. 49/ Cathedral in Bayonne: Mass on Saturday celebrated by the Episcopal bishop with a lot of people. Wellcome by the bishop Aillet. 51/ early in the morning, last prayer vigil in the Saint André chapel in Bayonne with Spaniards and transfer to the Spaniards.